Remove the cylinder head cover. Refer to “engine top side disassembly” . Remove the cam chain guide no. 2 (1). Remove the cylinder head. Refer to “engine top side disassembly” and “engine bottom side disassembly” . Remove the starter clutch. Refer to “starter clutch removal and installation” in section 1i . Remove the cam chain guide no. 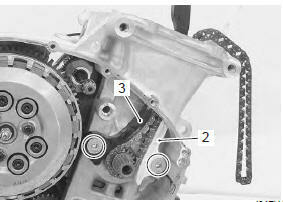 1 (2) And cam chain tensioner (3). Install the cam chain guides/cam chain tensioner in the reverse order of removal.